Set Up Your Profitec Pro 300. 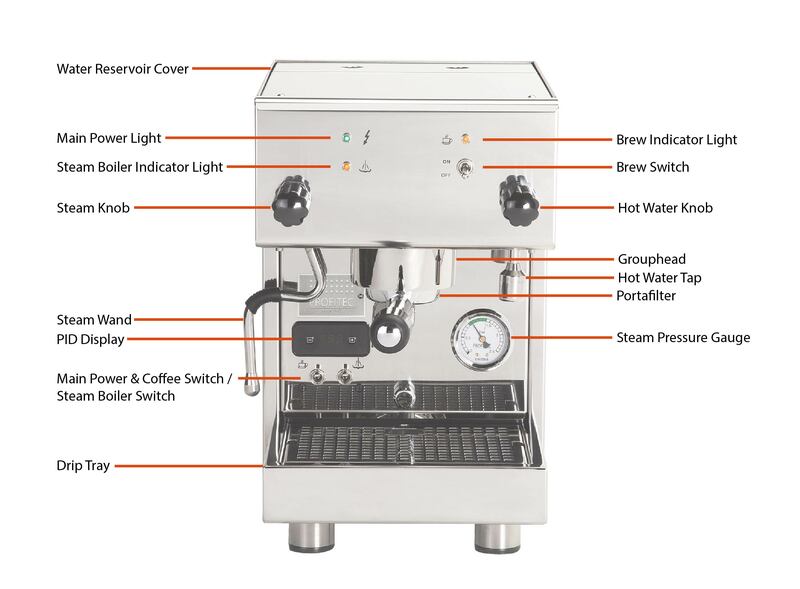 In this manual, you should find everything you to need to operate and maintain your dual boiler, saturated group head espresso machine. Please read carefully before using your machine Profitec Pro 300 Espresso Machine. If you need any assistance, be sure to contact us. Let's get started! Lift the water tank lid and remove water tank. Rinse it thoroughly before filling the water tank with cold, filtered, softened water and place it back into the machine. Close the lid. Plug the machine into an electrical outlet and turn the coffee switch and steam switch on by placing the metal switches in the upper position. The boilers are now being heated and the green and orange control lamps will come on. You will hear the pump filling fresh water into the boiler. Turn on the coffee switch. As soon as water is released through the brew group, turn off the coffee switch. The coffee boiler is now filled with water. Since a lot of water is used for the initial filling of the boilers, the water tank will need to be refilled with water. The PID-display indicates the current temperature of the coffee boiler. Should the water in the tank fall below a certain level, the machine will turn off automatically and the PID-display goes off and you will have to refill fresh water. The machine will heat up automatically again. If you have switched on the steam function, please wait until the pressure gauge reads a value of about 1.0 – 1.3 bars before use. In general, the machine will be heated up in about 10 minutes but we recommend waiting about 12 before the machine is ready for use. It is recommended to leave the portafilter locked in the brew group at all times. This keeps it warm for optimum temperature for coffee dissension and also saves the brew group gasket from wear as well. 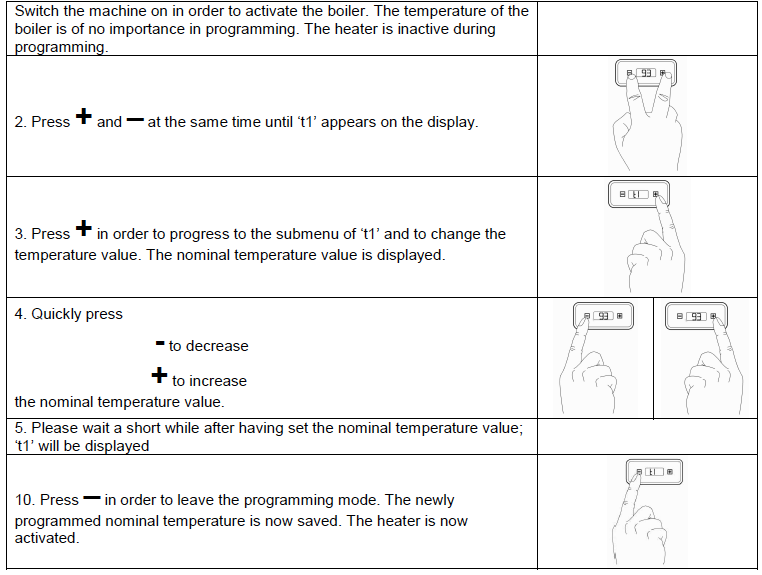 temperature of the boiler is programmable and controllable. The temperature, or rather the pressure of the steam boiler, is regulated by the pressure switch and is not adjustable from the outside. PID stands for “proportional-integral-derivative”. The PID-control displays the temperature of the coffee boiler.